Just steps to Cooks Brook Beach, this is where your Cape Cod family memories begin! This a short and easy walk and there are no stairs required to access the beach. Pull up to your cottage and witness the ocean just steps away! Recently purchased and renovated with many new Cape-style furnishings and fixtures that will add even more comfort to your stay! The sandy beach with warm waters on Cape Cod Bay in North Eastham is perfect for small children and enjoyed by all ages! Off-street, private parking for three cars with room for a boat or trailer. Private landscaped yard. Gas grill for cooking your favorite summertime recipe! After a stroll on the beach, take in the salt air of a warm summer evening while kicking back in the screened-in porch! Spacious master bedroom with queen bed and large second bedroom has two twin beds making for comfortable sleeping quarters for all. Third bedroom with two single beds. Lots of screened windows to hear the wind, sea and crickets. Comfortable living area has plenty of room for games or enjoy the evening watching the flat screen cable TV. Shower under the stars in the large cedar, outdoor shower with hot water and changing area. 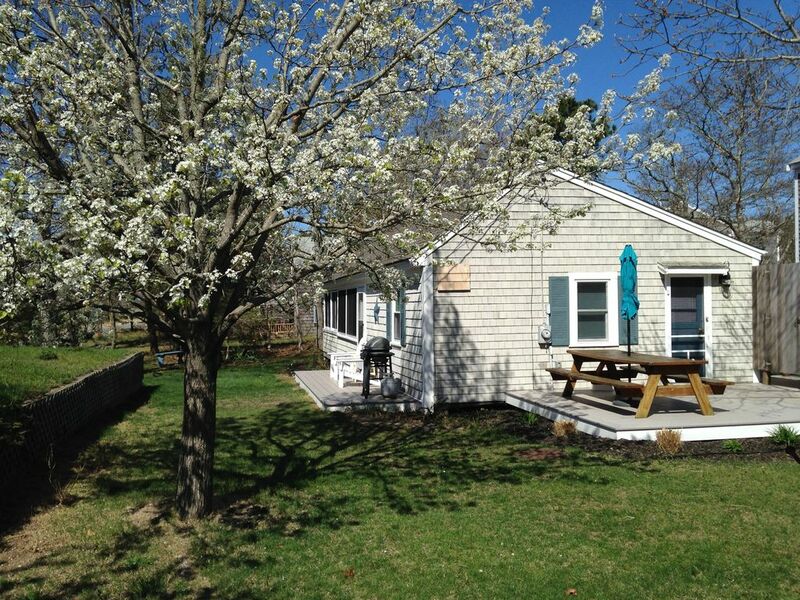 Cape Cod Vacation: air conditioning, fully stocked kitchen, blankets, pillows, cable TV, WIFI and DVD. Bed sheets and towels not included, but available for additional charge of $25 perperson. NEW gas log fireplace for those cool off-season nights provides plenty of heat to keep you cozy warm! Shower only, no tub. Also, large, private outdoor cedar shower with hot/cold water and footwash plus changing area. See the warm bay water as you pull up to the cottage! A/C in two main bedrooms and an A/C mini-split provides plenty of cooling on even the warmest days. Even cools the third bedroom. Great house....wish it was mine !!!! Being so close to the beach was wonderful and at this time of year there was very little traffic....very quiet! We loved it. As shown. Immaculate. Well supplied kitchen with plenty of utensils which I appreciated as I like to cook. Furnishings are lovely and well thought out. We loved the sunporch. The ocean is right there! Charles and Paula were helpful and responsive. We will probably go back but will wait for owners to make the insulation changes they have planned to come back in cool weather. That was our 4star instead of 5. Be sure to note that you need to bring sheets and towels. Thank you Linda. The unusually early arrival of extreme cold this year was unexpected. Once the ground thaws, the contractor can do his work which should help warm the floor. It otherwise appears that you were warm and that the new mini split heater kept the temperature up along with the gas fireplace. We're glad that you enjoyed your stay and look forward to having you back. Cozy, efficient, everything we needed, beds were comfortable, would happily come back again. Thank you Lillian. Please do come back again! The cottage was very nice. While staying there, we experienced two kinds of weather for a Fall stay, we had two days of warm, humid weather and a couple of rainy, cool days. The gas fireplace warmed the cottage on the cooler days and made it cozy. The cottage is well equipped with dishes, pots and pans. It is in a beautiful location, the beach a few steps down the road, we saw some gorgeous sunsets there. Also Eastham is a convenient location to a lot of Cape Cod beaches and attractions. We had an excellent week at Steele Away in Eastham! The gas fireplace was much appreciated during a cool week in late September. The property had everything we needed -- and then some, with plenty of space for four adults. We loved the proximity to the beach and had some lovely walks on the beach when the tide was out. The owners have clearly thought of everything in terms of meeting the needs of their guests and we will definitely be returning next year! Everything went very smoothly with booking the property and we appreciated all communication from the owners. Thank you for a great vacation! A very nice vacation rental. The owners have upgraded the property & it's close to the beach. From first sight this is a very good rental. Exterior and interior upgrades are obvious (see photo flip-folio located on the hanging plate cabinet). We loved the spacious hot water outdoor shower. Washer and dryer are a plus for mid-week laundry (didn't have to pack as much clothing). The gas fireplace was great for mid-September chill mornings and evenings. Cook's Brook Beach, a short walk away, had beautiful sunsets. Having good cable TV made for good am and pm news and weather viewing, and evening baseball games. Alexa was a hoot. One moment "she" could understand "Eastham" and the next not. Overall, a good, solid rental. Only a few suggestions, some of which may be in the next wave of upgrades: 1-indoor shower had wonky doors and some mildew/mold around bottom. 2-Bathmat could have used a good washing before we arrived; we weren't sure if stacked washer would be too out of balance, or we would have washed it. 3-Beds were too hard for any of the 3 of us to sleep comfortably. 4-Sofa and matching chair were also uncomfortable to sit on for any duration. 5-House instructions could be updated to correct wifi password typo (case-sensitive). Thank you Michelle. We just added the Alexa to all four of our cottages this year and the response has been overwhelmingly positive! It appears that you enjoyed many of the great features of both the house and the local area. Although we have made extensive renovations to the property since we purchased it a few years ago, our work is not done. We do our best to create as comfortable an environment for all of our guests and we take all feedback and suggestions to heart. We are in the process of applying for a building permit to tear down the bathroom and build a new one which would include a whole new shower/tub, double vanity and add significant footage to the existing bathroom. We are converting to town water at the end of the season and will no longer need a shed with a well pump and filtration system, so that space will be incorporated into the new bathroom as well. When it comes to bedding, it can be a challenge. It is hard to satisfy everyone, but we do our best. We will consider your comments though. The information sheet was updated a while ago when we discovered the error in the password. Our apologies if you didn't receive an updated copy. Thank you again for your suggestions and we hope that you'll come back again! Spacious rooms, wood floors, bead board, and a perfect location make this cottage a fantastic setting for unwinding with your family, a girls’ getaway, or a golf adventure. Outside, a large picnic table and umbrella provide a perfect place for lobster dinners and lively conversation after a day of sun and surf. Start creating YOUR happy memories! Gateway to the Cape Cod National Seashore, the Town of Eastham is a coastal resort community straddling the arm of Cape Cod. Located on the outer Cape, the town is bounded on two sides by land, the other two by water, the Atlantic Ocean and Cape Cod Bay. Eastham is a quiet town with several ocean and bay beaches, a host of kettle ponds, pretty country lanes, panoramic views of Cape Cod Bay and the Atlantic Ocean, and lots of wide-open space for nature lovers. The Audubon Sanctuary in Wellfleet is a popular spot and is only several miles away. Rates are subject to change until reservation is confirmed. Massachusetts Lodging tax is 12.45% for reservations that begin after July 1, 2019. If your booking is for prior to July 1, 2019 and you are charged tax by the web site, then your tax will be refunded by the owner.